Lucy | Meet The Ambassador | RAPTOR Inc.
Lucy: was banded when she hatched from a nest at the Gulf Tower in Pittsburgh, PA in June 2003. She came to RAPTOR Inc. 4 months later after being found at the Greater Cincinnati Airport with left and right wing injuries. She is now 16” tall, weighs 2 lbs and has a 42” wingspan. Populations of Peregrine falcons declined significantly after WWII due the use of the pesticide DDT. Starting in the mid 1970s, a successful captive breeding program began re-introducing the birds into the wild, including into cities where abandoned peregrine nests were found on buildings. 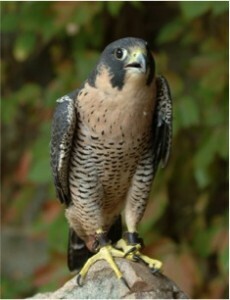 Cincinnati has its own pair of Peregrine falcons that nest each year on top of the Fourth and Vine building downtown. Be sure to check out the LIVE webcam April – June on our website to view the Cincinnati Peregrine Falcons which nest downtown on the Fourth and Vine Building!